The B2B arena is incredibly competitive, and will only grow more cutthroat over time. Every company is doing everything they can to draw in prospects, and that often means a wide range of inbound marketing content. Bringing in website traffic is a prominent goal for most companies, because your website is your biggest lead generation channel. All your inbound content drives traffic to your site, where your CRO can do its job. The harsh reality is that only approximately 2% of the traffic your website gets will actually convert, and the rest are leads you almost had. We’re going to introduce you to a tool that changes the playing field. When someone visits your website, it’s a clear signal that they’re interested in what you’re offering. Most prospects are 70% of the way through their decision-making process when they seek out a vendor. This means that the traffic on your website consists of highly-valuable leads. It also means that if they don’t convert on your site, they’re very likely going to end up on a competitor’s page – where they might convert. 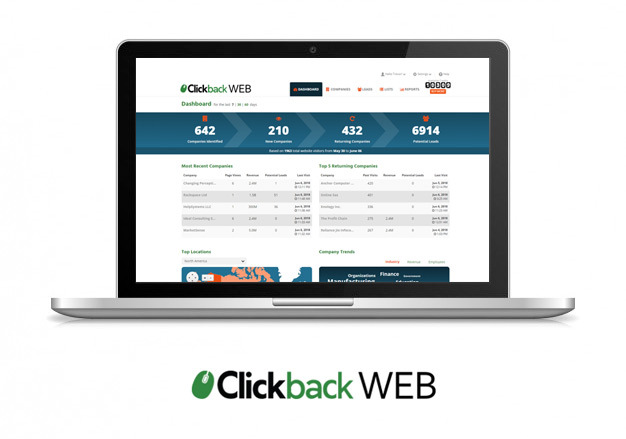 Enter Clickback WEB, a tool designed to give you the chance to reach those B2B leads who vanished from your site without converting. It’s a game-changer. Imagine you’re a company with a product aimed at software companies. If someone at a major player like Microsoft was looking at the products on your website, that’s a lead you’d really like to have, right? If they looked around and then left, you’d have lost a highly valuable lead. And you’d never even know it. If you were using Clickback WEB, it would play out a little differently. You’d log in and see that Microsoft visited your site, and have the opportunity to get contact information for leads there. In fact, you’d be able to see the companies Clickback WEB identified on your site. You could even filter the list of companies so you can see at a glance which visitors most closely match your target audience. You don’t have to do very much configuration to get it up and running. Installing it is a matter of pasting a snippet of code in your website’s header or footer, and that’s it. It will start identifying your leads right away. There are a whole lot more features than just a list of companies and leads, of course. You can, for example, easily assign new leads to your sales team, and export lead data. And a whole lot more. See it for yourself – there’s a 14-day free trial available, which includes a live, personalized 1-on-1 walkthrough of the software to make sure you get the most out of it. Clickback WEB can identify companies that visit your site based on their IP address. When a business visits your site and is identified, Clickback WEB logs the visit and adds it to your account so that you can see it when you log in. Individuals’ personal identifiable information (PII) is protected by a set of privacy laws, and it would be illegal to gather that information without the explicit consent of the individual. Businesses are governed differently, however, which is why Clickback WEB can identify company information based on their IP address, but not PII. Clickback WEB has more to offer than just a list of leads. It has a range of tools you can use to fine-tune your lead generation. If you have a lot of traffic, you’ll see a lot of leads in Clickback WEB. That’s great, of course, but not all leads are created equal. You want to go after the most promising, valuable leads first, right? Also consider whether there are any criteria that would totally exclude a company from being a potential lead – like if they’re your competitor, or an existing customer. You might want to only focus on companies in a particular industry, or above a certain revenue threshold. You’re halfway there – now it’s time to consider what events and behaviors on your website would make a lead more or less valuable. For example, a lead that only visits your home page, stays for 12 seconds, and then clicks away might not have the most potential. On the other hand, a visitor who reads a blog post, then visits your home page, a product page, and a pricing page is much warmer. To start off, create a short list of key pages and behaviors that indicate that the visitor is especially interested (and therefore a valuable lead). Product and pricing pages are good ones to start with, as well as time spent on page. In Clickback WEB, you can give each of those attributes, pages and behaviors a point value. The more important the criterion is for you, the more points you should give it. For example, if you’re especially interested in companies in the healthcare industry, you could give that industry a value of 5. If you see visitors who stayed on the page for over 1 minute as slightly more valuable, you could give that behavior a value of 1. When a visitor meets one of those criteria, the value you gave that criterion is added to that visitor’s “visit score”. The end result is that each visitor gets a score. The more the visitor (and their browsing behavior) matches your “high-value lead” profile, the higher their score will be. We’ve only scratched the surface of what you can do with Clickback WEB, but the main takeaway is this: it’s a tool that lets you tap into the leads that your website didn’t quite manage to convert. It’s not just a B2B prospecting tool. It’s a definite game-changer. Try it for yourself – get your 14-day free trial today. There’s no credit card required, and no obligation to buy once your trial is complete.